Personal: Last year I started getting up at the lovely time of 4:30am so that I could be at the gym when the doors open at 5:20. I worked out, then showered and got ready at the gym and made it to school by 7:00 each day. Now that I've been sleeping in, I've still been going to the gym, but not as consistently or as early. It will be a challenge for those first few weeks, but I have to keep reminding myself how great it feels to have it checked off my list first thing each day, not to mention the fact that it really helps me wake up each day! Organization: I'm a very organized person. Last year, I did the Grade, Copy, File drawers, which was a great idea and worked very well. The only problem is that I didn't do any filing until the drawer filled up, and then it took me a couple of hours to sort through the giant, unorganized pile and get everything in it's proper place. This year, it's my goal to file everything weekly, regardless of how full that drawer is! Planning: I spend my entire Sunday planning for the week. I don't just mean a few hours. I mean from sun up to sun down. It's not fun. I really want to find a way to get my planning in during the week so that I can enjoy more of my weekend and not spend Sundays totally stressed out! Professional: Integration was a serious buzz word when I first came in to education. During my first teaching job, I was lucky enough to be at a Cornerstone Literacy school on a team that was selected to do a lesson study. Our lesson study integrated science and literacy and it was AMAZING. It was so much easier than I thought it would be, though I was part of a super team, which is probably what made it seem so easy. I've continued to integrate, but I feel I can do better than I currently am because I know that integration is truly possible across all subjects, it just takes some work and thinking "outside of the box". This year, my teammate and I are really in sync and we both want to integrate wherever possible so I am really excited to see what we can accomplish this year! 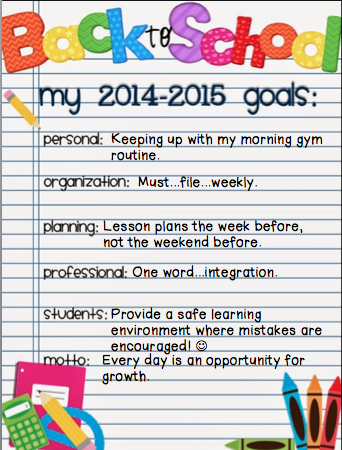 Students: It is always my goal to make sure that students have a safe and positive learning environment. I used to teach at a responsive school and love the responsive approach. I truly believe that we must build a community of learners, a classroom family who can feel safe, and know that mistakes are ok because we make them, we recognize them, and then we identify how we can grow from them. I never allow anyone in my room to make another child feel bad for making mistakes. Goodness knows, I make at least three a week one a day and I always acknowledge them with a smile because I never want students to see mistakes as a negative. Mistakes are an opportunity for growth! Motto: What a nice segue in to this one. Every day is an opportunity for my students and I to grow. As a teacher, I grow from the professional development I receive, I grow from my colleagues, but most importantly, I grow from my experience with my students. Similarly, my students grow from the instruction that they receive from me, the accomplishments that they achieve in my classroom, and the hard work that they put in to reach their fullest potential. Opportunities for growth are all around us every day. Wishing you all a wonderful 2014-2015 school year! I need to start a workout routine early in the morning to get it checked off my list! I love the motto...sometimes we forget we can grow as well as the students.